Former BJP ministers Yashwant Sinha and Arun Shourie and advocate Prashant Bhushan have moved the CBI with a complaint against Prime Minister Narendra Modi, Defence Minister Mohan Parrikar, Dassault Aviation, its CEO Eric Trappier and Chairman of Reliance ADAG Anil Ambani in the dubious Rs 60,000-crore Rafale fighter jet deal. In a complaint to the CBI, they have sought registration of FIR against the PM, Parrikar, Trappier and Ambani while stressing that Modi and Ambani kept all public servants in dark about their conspiracy “by way of which, Mr. Modi obtained an ‘undue advantage’ from Dassault Aviation, for awarding a contract for 36 Rafale aircrafts in ‘fly-away’ condition, by abusing the authority of his office and doing his public duty dishonestly and improperly. The ‘undue advantage’ has been received by his close associate and friend Mr. Ambani. As a consideration for abusing his official authority and doing his public duty dishonestly, Mr. Modi compelled Dassault to choose Mr. Ambani as an offset partner, by way of which Mr Ambani received, and is receiving, and will continue to receive, for the next 40 years, an ‘undue advantage’”. In the complaint addressed to Alok Kumar Verma, Director, CBI, the complainants say they are aware of the need for sanction to prosecute the accused but urged the probe agency to at least take the first step. “We are also aware that this will place you in the peculiar situation, of having to ask the accused himself, for permission to investigate a case against him. We realise that your hands are tied in this matter, but we request you to at least take the first step, of seeking permission of the government under Section 17(A) of Prevention of Corruption Act for investigating this offence and under which, “the concerned authority shall convey its decision under this section within a period of three months, which may, for reasons to be recorded in writing by such authority, be extended by a further period of one month". “Of course, the prior sanction is not necessary, for registration of F.I.R. and investigating the offences committed by Mr. Ambani and Mr. Trappier,” it said. The complaint said the conspiracy is to provide an undue advantage to Ambani whose companies have been verging at the point of insolvency. It says though, in 2014, a Work Share Agreement was concluded between Dassault and H.A.L. (Hindustan Aeronautics Limited) under which H.A.L. and Dassault were to execute 70% and 30% of the work, respectively, for aircrafts that were to be made in India, on April 10, 2015, “the original deal was unilaterally discarded by Mr. Modi as under that deal H.A.L would have been the production agent for Dassault in India and there was no scope for Mr. Ambani to get an undue advantage” and added that “Mr Ambani incorporated a company called Reliance Defence Ltd. on 28th of March, 2015, just 12 days before 10th of April, 2015”. “It was solely in order to secure an undue advantage for Mr. Ambani, that public servant Mr. Modi abused his office and performed his public duty improperly and dishonestly by discarding, without authority, the old deal for 126 aircraft with Make in India by H.A.L. under Transfer of Technology. Instead, to obtain an undue advantage, to be received by Mr. Ambani, Mr. Modi unilaterally and without authority, proposed a new deal for just 36 aircrafts, with no Make in India, with no transfer of technology, all in a ‘fly away’ condition to be manufactured in France, that would have allowed Mr. Ambani to gain an undue advantage by being Dassault’s key offset partner. Dassault was singularly induced by Mr. Modi to accept Mr. Ambani as an offset partner in exchange for giving Dassault the 36 aircraft deal,” said the complaint. The complaint also spoke of sham defence companies of Ambani while adding that no investment has been made by Ambani in this sector. “The modus operandi is to squat on land that he has gotten at throwaway prices due to Mr. Modi’s influence and squat on industrial licenses granted to it, and conspire with Mr. Modi to bypass a legitimate tender process to discover L1 and go for “Inter-governmental agreement,” where Mr. Modi can abuse his influence to ensure Mr. Ambani is chosen as the offset partner,” it said. The complaint also alleged that the PM and Ambani abused their official position in light of the fact that Dassault’s production line would have shut down, had there been no contract from India. Sinha, Shourie and Bhushan alleged that the PM kept IAF, HAL, the Foreign Ministry, and even the Defence Minister in the dark about his impending designs. “The scam was however revealed when the actual price of 36 aircrafts was revealed in a Press Release by Dassault and Reliance (Annexure 33) and Financial Press Release statement of Dassault for 2016 (Annexure 45). Both the documents show the total price of the deal to be about Rs. 60,000 crores (about 8.139 Billion Euros) for 36 aircraft. This is the scam, for it works out to Rs. 1,660 crores per plane. This is more than double the price of the aircraft under the earlier 126 MMRCA deal. And almost Rs. One Thousand Crores more than the price that was furnished by Government itself to Parliament on 18th of November, 2016. This has resulted in a loss of over 36 thousand crores of Rupees to the public exchequer at the cost of national security, solely so that Mr. Ambani could receive undue advantages,” they said in the complaint. We call upon you to register an F.I.R., for the offence under section 7(a) & 7(b) & 7(c) read with Explanation 2 of Section 7, of the amended Prevention of Corruption Act, and Section 7, Section 13(1)(d)(ii), & Section 13(1)(d)(iii) of unamended Prevention of Corruption Act, against the Prime Minister, Mr. Modi, and investigate and prosecute the matter. We call upon you to register an F.I.R., for the offence under section 7(a) & 7(b) & 7(c) read with Explanation 2 of Section 7, of the amended Prevention of Corruption Act, and Section 7, Section 13(1)(d)(ii), & Section 13(1)d(iii) of unamended Prevention of Corruption Act, against the then Defence Minister, and investigate and prosecute the matter. We call upon you to register an F.I.R. against Dassault Aviation and more particularly, its C.E.O., Mr. Eric Trappier, for abetment of the said offences, and investigate and prosecute the matter. We call upon you to register an F.I.R. 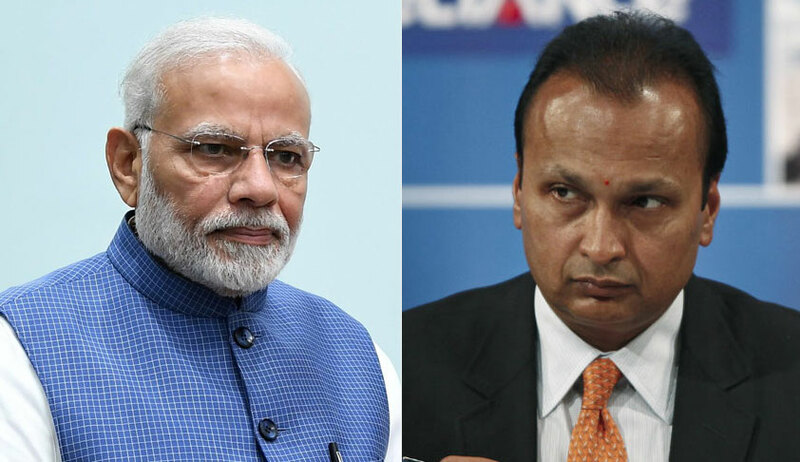 against Mr. Anil Ambani for conspiring with the Prime Minister, Mr. Modi, to receive an undue advantage/pecuniary gain against public interest, and investigate and prosecute the matter.